Stores a pending Interest and associated callbacks. Definition at line 58 of file pending-interest.hpp. 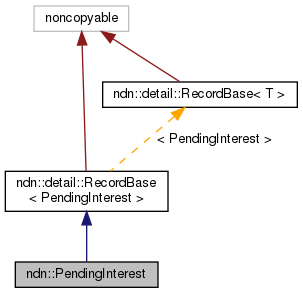 Construct a pending Interest record for an Interest from Face::expressInterest. The timeout is set based on the current time and InterestLifetime. This class will invoke the timeout callback unless the record is deleted before timeout. Definition at line 73 of file pending-interest.hpp. Construct a pending Interest record for an Interest from NFD. Definition at line 94 of file pending-interest.hpp. Definition at line 106 of file pending-interest.hpp. Definition at line 112 of file pending-interest.hpp. Record that the Interest has been forwarded to one destination. A "destination" could be either a local InterestFilter or the forwarder. Definition at line 123 of file pending-interest.hpp. Record an incoming Nack against a forwarded Interest. Definition at line 134 of file pending-interest.hpp. References ndn::lp::Nack::getReason(), ndn::lp::isLessSevere(), and nonstd::optional_lite::nullopt. Definition at line 151 of file pending-interest.hpp. Definition at line 163 of file pending-interest.hpp. Set cleanup function to be invoked when Interest times out. Definition at line 174 of file pending-interest.hpp.